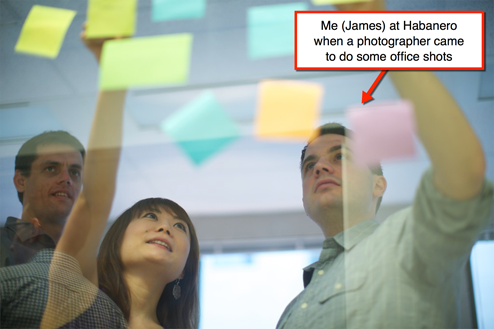 [unenviable example #1] I will never forget the workplace where I had to write down exactly what my manager said in a notebook and ask him to sign it before he would give me the information I actually needed to do my job! Otherwise he would always give partial information and pass blame for errors. This continued for two years! [unenviable example #2] Or the workplace where I was told you could not talk to execs because they were too important to spend time with new hires. [unenviable example #3] Or the workplace where our team was never allowed to work remote/from home by a boss who worked from their tropical beach home at least two months every year. In the last decade, I’ve worked in a wide variety of workplaces: as an employee and consultant. I’ve had a few wonderful workplace experiences and many terrible ones. When it comes to the terrible experiences, there was one commonality: companies that were just too big to change. So why are so many companies in 2016 still such terrible places to work? Some of the great places I’ve worked really cared about the individual and collective experience of their employees. They removed outdated processes and kept as few levels of management as possible. Great workplaces that I’ve experienced start with trusting their employees to do their best work (they hire them after all). Years ago, due to financial pressures, I was laid off from the very best place I’ve worked, Habanero Consulting Group – yet I would still would recommend it as an amazing to work and learn. They lived and breathed trying to keep a human, social workplace. But too many companies talk a good talk when it comes to engagement, learning, collaboration and innovation… but they don’t live it. Thus, they remain outdated, intimidating places, wasting money on countless change initiatives. Instead of reaping the rewards of listening to their people, the initiatives add layers of unhelpful job complexity. Worst of all, they fail to put people first. I’ve gained a handle on what it takes to shift a company from one that responds at the last minute to one that continually adapts. And now, with digital technology requiring adaptation, companies that don’t adapt won’t get full value from their tech investments. Your company benefits by doing what it preaches. But when finance takes precedence over people in corporate decision-making, very few are able to run a people-centric company. More than just good values, research shows that companies with people-centric cultures have (among many other positive things): greater stock market returns, greater customer or client relations, better brand recognition, longer employee retention, far superior recruiting power, faster agility, higher returns on innovation, faster adoption of new technology. How do you engage your employees with purpose, while speeding up their development, and going through continuous culture-based organisational redesign? That is the huge challenge facing today’s C-Suite according to Deloitte’s Global Human Capital Trends 2016. If you want to rise above these challenges and trailblaze, don’t be too big to change. You can’t meet these challenges repeating the same efforts as before. Companies are rife with outdated leadership and training practices, unrealistic or unrepresentative employer branding, and a lack of genuine purpose and vision inspiring the workforce. Your culture may need help changing to focus on people – especially as millennials will be by far the largest percentage of the workforce by 2025. We need companies to give energy and inspire creativity and innovation. As we wrote in a recent article, millennials need purpose to be engaged at work. But everyone needs purpose at work. Purpose drives culture and culture drives the experience and engagement of teams. I believe there are three levels to a purpose-driven culture, that align well with the Deloitte report: individual, team, and company. You need all three firing to be a truly enviable workplace. The Deloitte report found that 84% of respondents thought organisational learning was either “important” or “very important”. According to the report, “companies are not developing skills fast enough or leaders deeply enough.” In particular, the report calls out the need for supporting self-directed learning. The Brandon Hall State of Leadership Development Study in 2015 found that only 20% of companies identified millennial leaders as critical for development in the next 24 months. Taken together, we have a huge need to support the self-directed learning of the younger generations in the workforce. Companies need to inspire individuals to find purpose and build their learning networks inside and outside the company towards that purpose. That means starting with the individual. Even with you. What meaning do you find in your work and why? How does this meaning drive your purpose for turning up every day at work and doing your best? Without a vision and purpose, how can employees take charge of their own learning? If a your culture stifles ideas and sharing, it is not a learning culture. And technology won’t solve this problem, although it can help accelerate a genuine purpose-driven cultures. After… years of struggling to drive employee engagement and retention, improve leadership, and build a meaningful culture, executives see a need to redesign the organisation. But I don’t believe a top-down re-org is what is required. Instead, we need to get back to a focus on teams. Self-forming, collaborative, supported. A truly purpose-driven company would be a network of teams, all driven by that purpose. A focus on teams naturally means a reduction in excess hierarchy and other purpose and engagement killers. It’s nothing new either. Back in 2000, Strategy+Business published an article on Corporate Culture in Internet Time. It talks about the need of creating a culture of teams, with inter-team learning, different team cultures, and experimentation. We still haven’t got to a place where this exists widely in business. With purpose-driven individuals, we can create and support purpose-driven teams. Social, collaborative, digitally expert, and experimental – the key features of creative, innovative, and productive teams. Great teams are peer learning havens in disengaged cultures. Imagine your company comprised solely of a network of purpose-driven, great teams. Suddenly, organisational redesign looks very different. 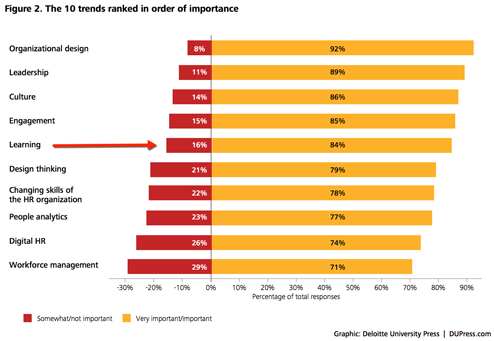 The recent stalwarts remain in the Deloitte report – “Engagement” and “Culture”. Culture can be a competitive advantage – yes. 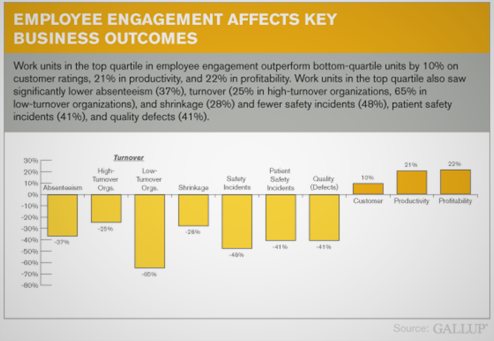 And importantly, according to the report, “employee engagement and retention today means understanding an empowered workforce’s desire for flexibility, creativity and purpose.” A culture of purpose – that’s what you build from the individual upwards. CEOs and other executives need to model exactly what they hope to develop as their culture. As Rob Goffee and Gareth Jones write in Why Should Anyone Work Here? : “top management…need to be both cognitively and emotionally committed” to any changes. The trends highlighted in the Deloitte report are not ones to be “run” by HR, Comms, or Marketing, pushed onto the organisation without conversation and without executive modelling. A network of teams model helps all employees own the purpose and culture of a company. 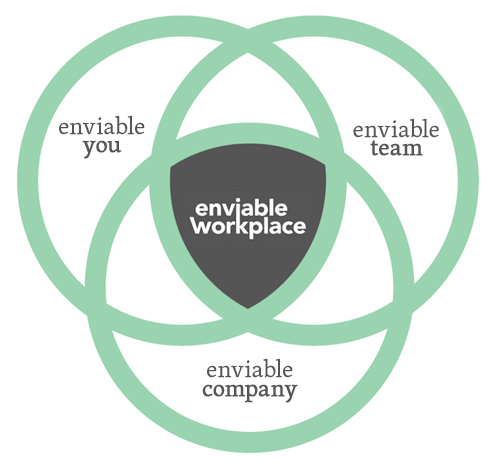 Is [insert your company name here] an enviable workplace? It’s just not the case that one company can copy the “successful” culture of another. Every company has a different cultural DNA that delivers a human and inspiring workplace. For your company to be an enviable workplace, you need to consider how you can leverage individuals and teams to build a network of purpose-driven teams. Ditch the old change management methods and build something new. Don’t be too big to change.